The annual holiday is the highlight of the year for so many of us, it’s a time to relax, to reconnect with family and to create memories. The anticipation starts when booking your holiday, the excitement of buying your sun care is a cherished ritual, the look, feel and the smell all adding to the experience. 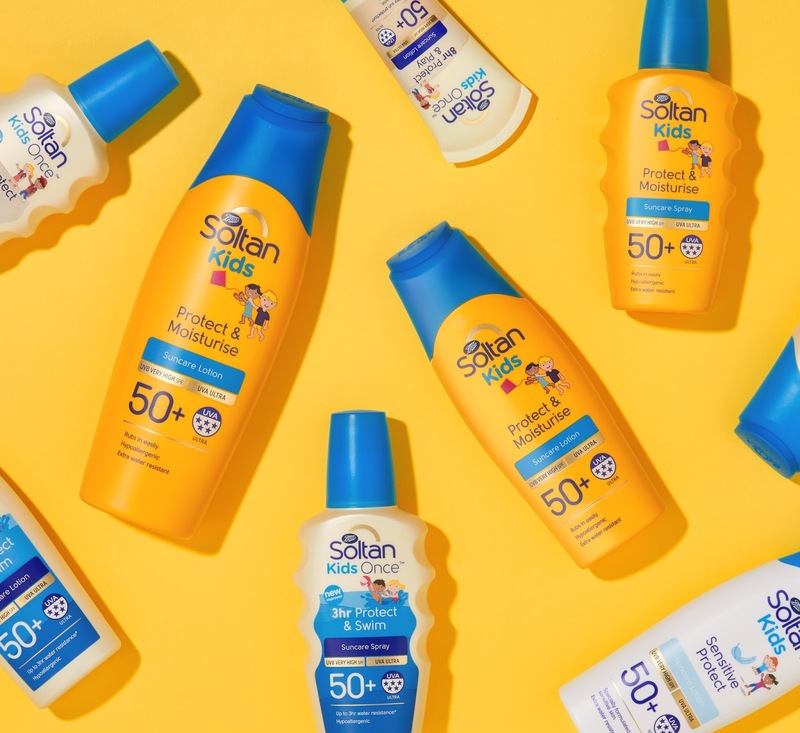 The sun still plays a big part in the annual holiday (and the Summertime in general) for many of us, but with such increased awareness of the dangers of the sun, it falls to a trusted brand like Soltan to deliver a clear message and put our minds at rest. 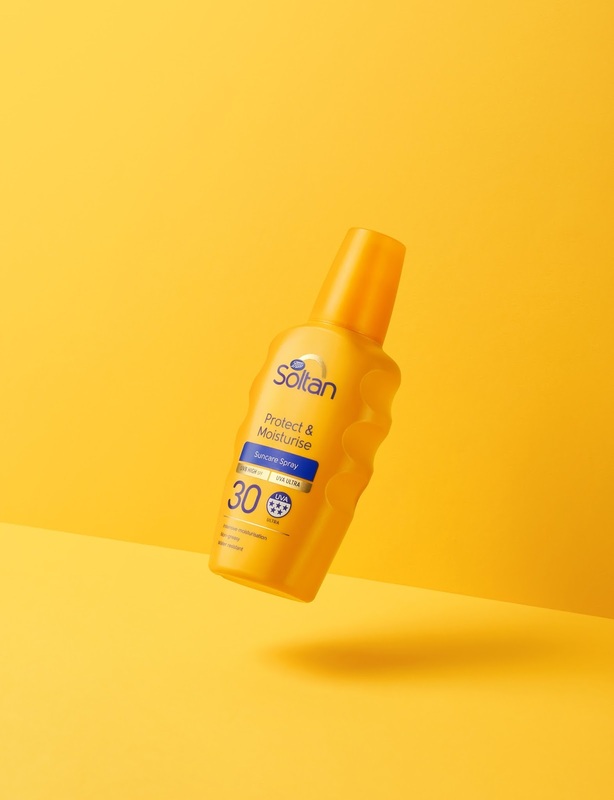 Soltan approached Two Create to help retell their important message through it’s brand and packaging and to help solve some important functional issues along the way. 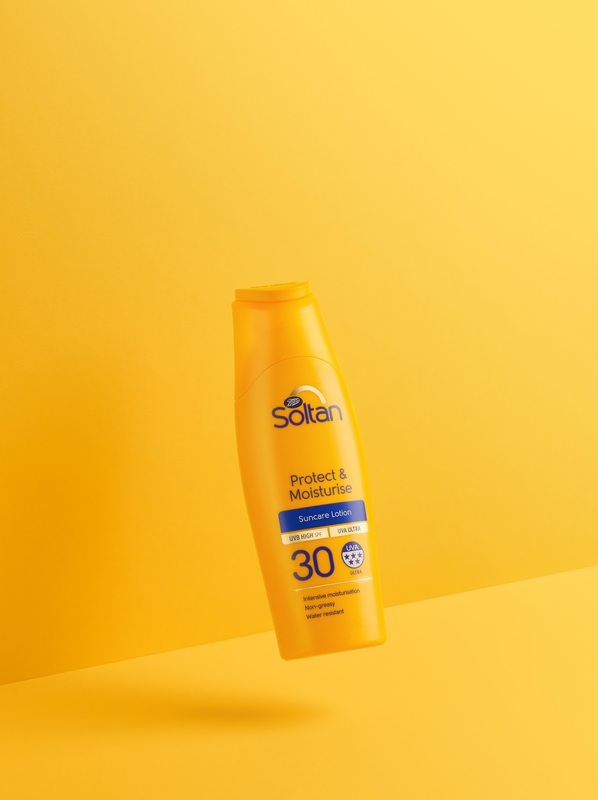 An innovative product since it’s launch in 1939, Soltan was the first to develop UVA 5 star protection, a technology that the manufacturer, Boots created and still continues to set the UK standards. 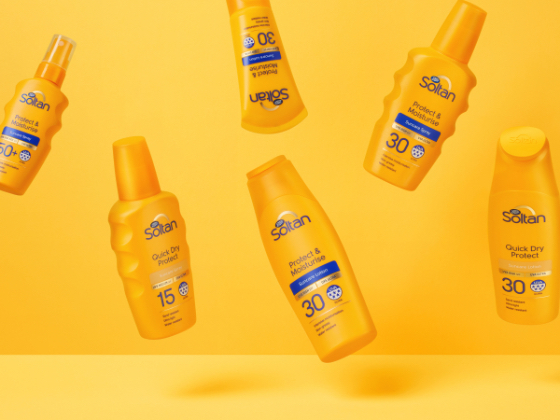 However, for many of us the messages are confusing, UVB are the shorter wavelengths of sunlight which typically cause the surface of the skin to burn - this is dealt with by the SPF in your suncream. However, sunlight also contains UVA, these are the longer wavelengths that penetrate deeper into the skin and are more likely to cause premature ageing and skin cancers. 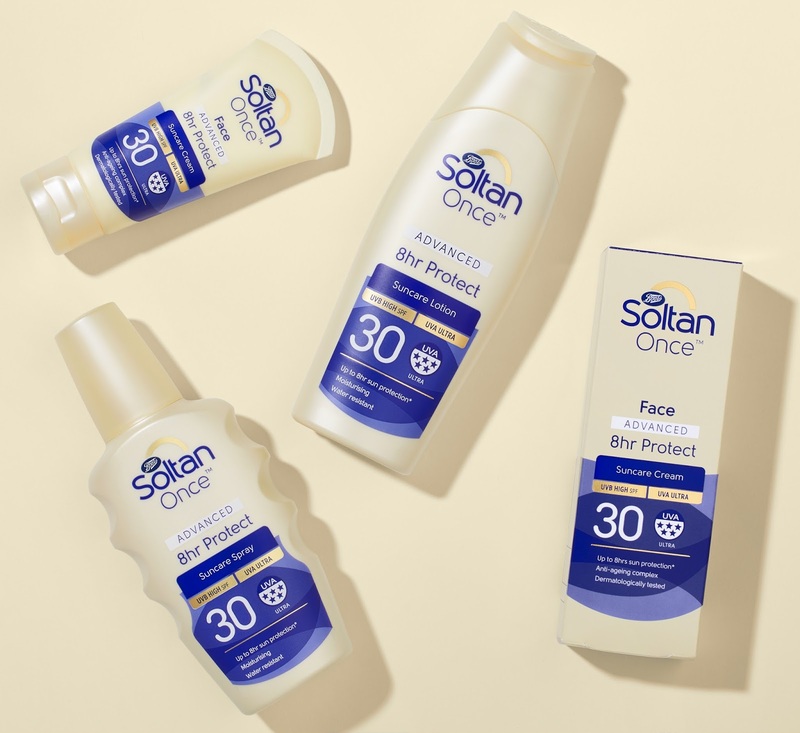 Soltan offers the maximum protection possible from harmful UVA rays - something that many of it’s competitors still haven’t been able to achieve. The message is clear, Soltan loves the sun and so do you, Soltan provides freedom from danger, freedom to play. Two Create set out to cut through the noise of the category, to identify the necessary and eliminate the unnecessary. Confused and anxious messages were replaced with expertise, clarity and permission to go and have fun in the sun! Permission was granted with the use of yellow, owning the shade (under many different forms of lighting). The colour was defined and made more consistent by removing pearl or metallic additives and using soft matte textures to flatten it further. The tone of voice was made more confident and the front of packs de-cluttered, removing anxious double claims and creating a feeling of relaxed space. Copy hierarchy was made more logical and colour navigation bands introduced to assist decision making and repurchasing at the point of sale. 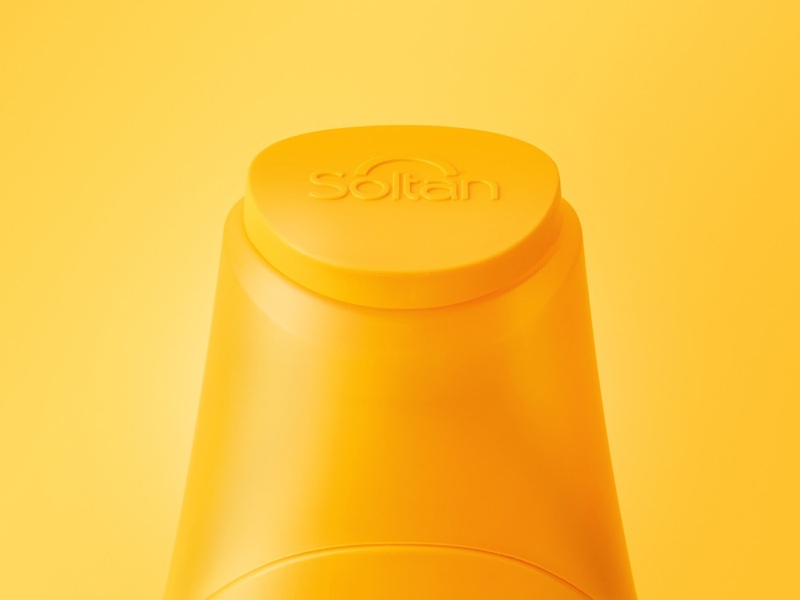 The current tottle (with cap at the base) clogged with sand, so this was redesigned as a lotion bottle with an active form, better representing the brand values and to enhance the user experience. A sunrise curve was added to the bottle, complementing the logo with a glow created from within, made possible using the refraction of light through the semi-translucent neck of the cap. The form is stable and travel friendly, advanced yet positive and active. The lotion spray bottle has undergone rigorous ergonomic development with numerous trials resulting in a spray which functions in even the most greasy and sandy hand, ideal for coving slippery children! The logo was re-defined, mixed messages were clarified with a positive golden arc and typography made more expert with soft geometry.